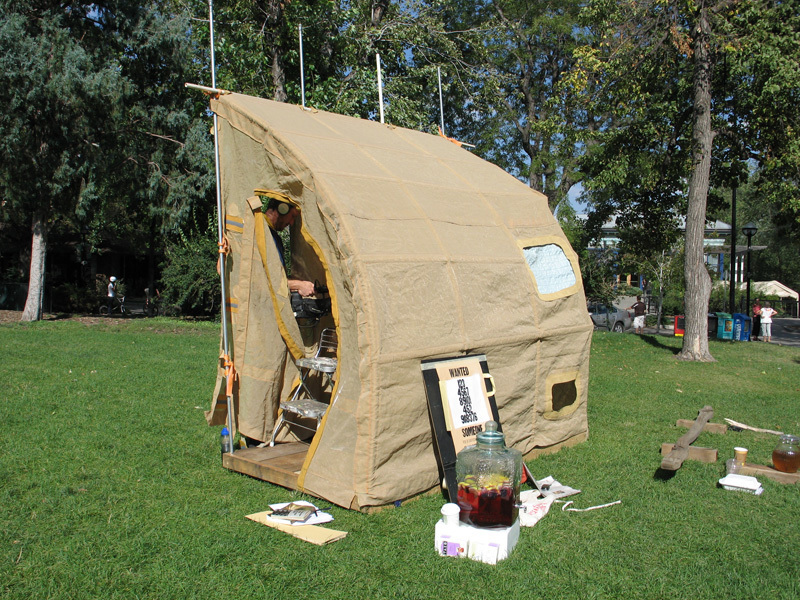 Futurefarmer's Energy Tent and Building Workshop lands at the Nature Museum in Chicago, Illinois. During 3 days Futurefarmers in collaboration with the Peggy Notebaert Nature Museum will host two building workshops and 4 discussion sessions led by scientists from the University of Chicago. The general public will be invited to participate in discussions with the guests in the Energy Tent. The outcome of these discussions will be a series of questions relative to the issue of "Energy" and the upcoming 2008 elections. The questions produced in small discussion groups will be posed to larger groups in the form of a Continuum**(see below for more information). Each morning, Futurefarmers will conduct special workshops with Chicago area teenagers from the Chicago Park District TRACE (Teens Re-Imagining Art/Community/Environment) program and the Nature Museum CPS summer interns. 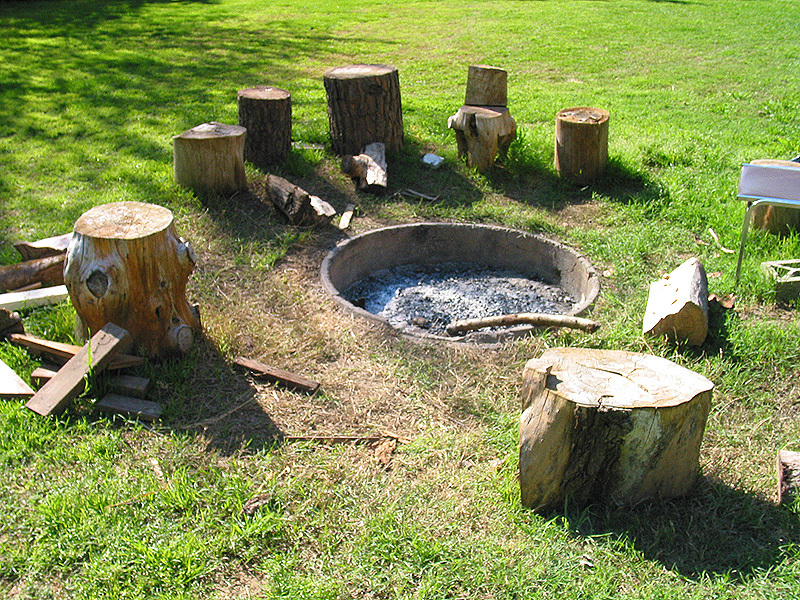 ENERGY PLANS is part of the Brushfire Project. Brushfire is Provisions’ new national public arts initiative showcasing key contemporary artists whose public projects engage crucial social issues such as immigration, the war in Iraq, food, sustainable energy, housing, the electoral process, the economy, health, and the environment. Taking place in highly visible public settings such as state fairs, suburban shopping centers, public parks and highly trafficked recreational areas around the United States, BrushFire aims to enrich the environment for public discussion about the value of democracy in the crucial run-up to national elections in November, 2008. BrushFire will culminate in an exhibition at The American University Museum in September, along with a DC-wide festival of exhibitions and arts events on key social issues. BrushFire is supported by the CrossCurrents Foundation. Preparation of posters and banners. Poster: Silkscreen series printed on recycled grocery bags. David has worked on a wide range of topics pertaining to the global carbon cycle and its relation to global climate, with special focus on ocean sedimentary processes such as CaCO3 dissolution and methane hydrate formation, and their impact on the evolution of atmospheric CO2. He teaches classes on global warming, environmental chemistry, and global geochemical cycles and has written a textbook for non-science major undergraduates called Global Warming: Understanding the Forecast, published by Blackwell Press, and is currently working on a book entitled From Here to Eternity: Global Warming in Geologic Time. Albert's work focuses on understanding how the composition of Earth's atmosphere and oceans have changed over the 4.5 billion years of Earth's existence. He also researches the cycling of nutrients (like phosphorus, nitrogen, and iron) in the modern ocean. Albert is involved with astrobiology research. In particular, he is examining how the composition of the surface and subsurface of Mars might be chemically altered in distinct ways if microbial life exists or existed on Mars. Associate professor, Department of Ecology and Evolution at the University of Chicago. His work focuses on natural variation in seasonal life history adaptation in Arabidopsis and Aquilegia and Ecological Sustainability: As a model for the built Environment. Robert's research primarily involves the Earth's climate: how it functions and how it changes. He has a particular interest in what role the ocean has in controlling variability in the Earth's climate. This has led him to work on ocean and coupled climate models and conduct research into the computational, mathematical and theoretical issues involved in their construction. Amy Franceschini is an artist and educator who works with notions of community, sustainability and a perceived conflict between humans and nature. Her work manifests as websites, installations, open-access laboratories, and educational formats that collectively question or challenge the social, political and economic systems we live in. She founded Futurefarmers in 1995, and Free Soil in 2004. She is currently a professor of art at University of San Francisco and visiting faculty at California College of the Arts. Working in many media Stijn reveals the subtleties of life via film, video and interactive installations. His work embodies a sense of play and sensitivity that reminds us to take a closer look at what surrounds us. Stijn lives and works between Gent, Belgium and San Francisco. Michael is an inventor and designer working in many media. He is the analog anchor of the studio. Michael has collaborated with Futurefarmers since 1997. Michael is dedicated to working in the community, Swaine's "Reap What You Sew" Generosity Project involved him pushing an old fashioned ice cream style cart on wheels with a treadle-operated sewing machine on it through the streets of San Francisco. Currently, Michael is teaching at California College of the Arts. Daniel has worked as a cultural and political organizer in Chicago for the last seven years, initiating a number of large-scale local projects and events. He is currently serving as the editor of AREA Chicago print/online publication dedicated to researching and networking local social and cultural movements in Chicago (areachicago.org). He has also worked outside of Chicago as a facilitator for Creative Time and the National Alliance of Media Arts and Culture. His collaborative projects have been exhibited internationally and his writings have appeared in Clamor, Proximity (Chicago), BootPrint (St. Louis), the Journal of Northeast Issues (Hamburg) and the Journal of Aesthetics and Protest. He has lectured widely about the intersections of art and politics. 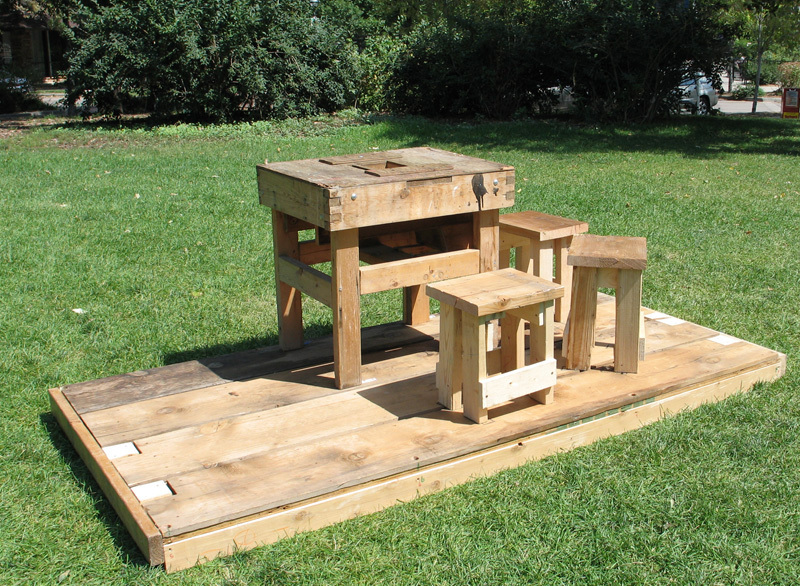 Stools will be made from recycled wooden palettes. The stools will be used to stand on during the continuums**. 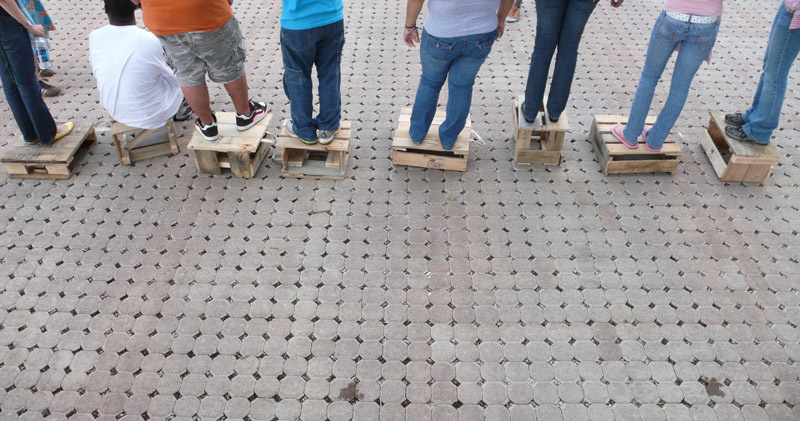 Design Challenge: Using a recycled wooden palette, design a 7.5 " tall stool or platform stand upon. It must hold the weight of kids and adults alike. Introduce them to the project. Picnic on lawn-- test out stools. maybe sit on stools to eat. Energy Plans Continuums were inspired by the work of Jacob Moreno. Jacob Moreno (1889-1974) sought to uncover the underlying social relations that bind people together and adjust the corresponding official hierarchies to reflect this reality. Moreno grew up in Vienna and moved to New York in 1925. He was a psychiatrist who developed many methods for both social and psychological development and understanding. Many of his techniques, such as “psychodance”, or the “living newspaper” did not catch on, and can only be found in his many writings. Other developments of his have become respectable elements of modern practice, such as group psychotherapy, and psychodramatic techniques including role reversal, doubling and mirroring—all used by psychotherapists today. In the field of social network analysis, his sociometric techniques are also still in use—including sociograms, visual maps of social networks. Moreno coined the term “sociometry” meaning the measurement of social relations. He devised some guidelines for creating sociometric experiments. One general principle was that the participants in the study should be warmed up to the process and adequately motivated. Also, every participant should feel that the experiment is an opportunity for to become an active agent in matters concerning thier life situation. Another guideline is that every participant in a group is also a researcher, and the lead researcher is also a group member. The formation of the direction of the research itself should come from the participants in the group. The sociometrist should facilitate this. For Brushfire, we will use another form of Moreno's: the Continnum. 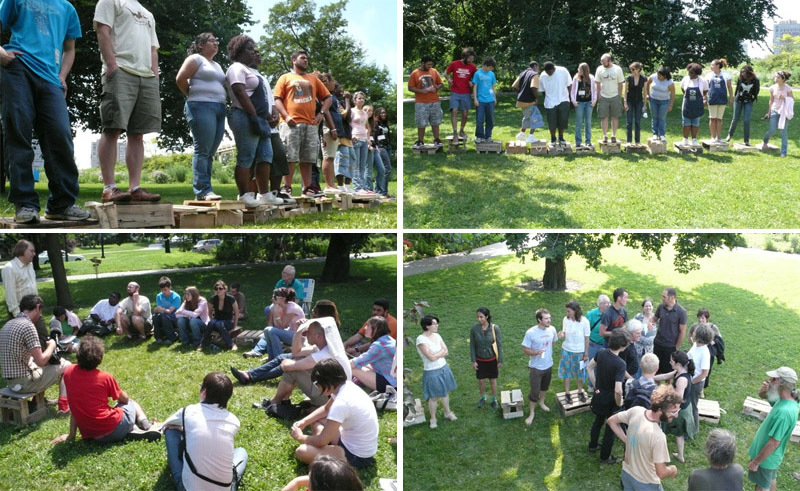 A group-exercise in which people are asked to position themselves physically on a continuum in relation to certain questions. For example, a question is posed: "Should we use nuclear power?" One end of the room would represent "No!" and the other end of the room would represent "Yes!". People would form a line based upon where they stand on the issue. They would then be asked to talk to people on either side of their position to ensure that they were in the right place relative to others' feelings on the issue. After discussing why people stand where they stand, new criteria might be formed for the question and shifts may occur. This method is used to physically visualize positions in a group around a certain issue. After each tent conversation a continuum will be performed. Workshoppers will be asked to join the continuum. The continuum will be defined and led by the most recent conversationalists. Participants will be asked to place their stool on a position on the continuum that relates to where they stand on that issue. Participants will then stand on the stool to declare why they chose to stand in that position. A photograph will be taken at the beginning and end of each continuum. Most likely, after hearing why each person is standing where they are, discussion and criteria shifts will influence people to change their position. The continuum will be video taped and later presented in the Brushfire Exhibition. A log of all continuums will be kept on a chalkboard attached to the tent.